You will never look at Saucepan Lids the same way again. Today we share a collection from a Melbourne Creator that are like nothing you have ever seen. We are huge Owl fans around here and with good reason. They are such a magnificent Bird and imagine our delight when we came across Robyn Stewardson’s amazing Kitchen Owls. Robyn is a busy Mom of 2 with a very supportive husband. Her Owls have been an internet sensation and it is easy to see why. Based in Melbourne, she has turned her hobby into an income and they sell on her facebook page the moment they are featured. She even created a calendar! Her business Focus on Art was founded in 2010 and she has been a trail blazer with many of her original creations inspiring others. 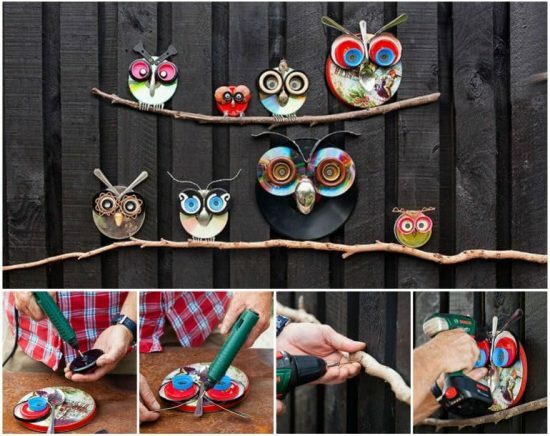 She even came to the attention of Better Homes and Garden when they featured a collection of Owls. They popped theirs on a fence and tree branch and as you can see above, they look fabulous. She reuses all sorts of items from the kitchen including saucepan lids, ladles, plates, graters, lids, tins, to name a few. There’s very little that escapes her eye and they all take on a different personality. Robyn has cultivated a loyal following and all by reusing kitchen utensils. She is a favorite at markets and shows that there’s cash to be found in trash. Be sure to visit Roby on her Facebook page and better still, give her a like or make a purchase. You can find her here.